This happened just 2 days ago. On Saturday I installed a new copy of Windows XP. It was a brand new copy and I put it on a brand new hard drive for the purpose of software testing. I finished the install and applied the drivers. I was behind a router which acts as a firewall. 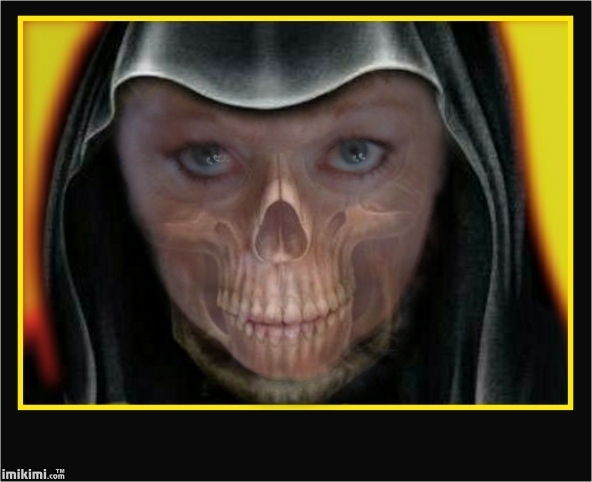 I opened the IE browser and went to a favorite site. I read the forums and exactly 23 minutes after the install I was receiving AV2009 popups. Itâ€™s scare ware. It told me I was infected and needed to download their program to remove the threat. I couldnâ€™t believe it. I didnâ€™t even have an email client installed, no Instant Messenger. I had not downloaded a single program or installed any Java or other add-ons. What’s worse is they had blocked my access to PC Pitstop and Several other sites that would have been usful in the removal. How does that happen? Iâ€™m not sure exactly how these scum bags do it but this is exactly why Microsoft joined with the state of Washington to recently sue these fake security scum bags. Fortunately I keep all of my protection programs on a thumb drive for emergencies just like this. I was able to remove this garbage with some fast help from PC Pitstopâ€™s Exterminate II and a couple of reliable Hijack and AV programs. Every day, makers of malware design new and sneaky ways of stealing our hard earned cash. 10 years ago I donâ€™t think anyone understood how numerous or sophisticated the purveyors of badware would become. But theyâ€™re here, weâ€™re surfing, and like it or not, weâ€™re challenged at every turn. Schemes are so numerous that itâ€™s hard to keep up with their names, much less how to prevent or repair their carnage. ScareWare is what I now see the most of. PC Pitstop has always worked hard to fight these increasingly nasty threats. It started with our original Pitstop Test, which identified not only settings and hardware problems but also programs running in the background. Many of the files it found were nastys, but nasty or not, The Pit Test found them and let you know about them. In the beginning we partnered with others to guard your information and protect your machine. Our forums have helped countless people remove every form of virus, bot, and scareware. Weâ€™ve made sure that trained helpers were available to you. Weâ€™ve recommended programs for removing each and every threat. Most everyone has used Spybot S&D or CleanUp or Adaware. These came in free and paid varieties and helped our systems run clean and strong. With driven purpose we developed our well known and industry-respected software to fight directly against these threats. Exterminate, Erase, and Optimize were all designed with the protection and performance of your PC in mind. Our insight into these threats developed because of the huge storehouse of information gathered from more than 100 million tests. â€œOne Hundred Million Tests and Countingâ€ recalls this event. We continued to advance the Pitstop Full Test until it became OverDrive. 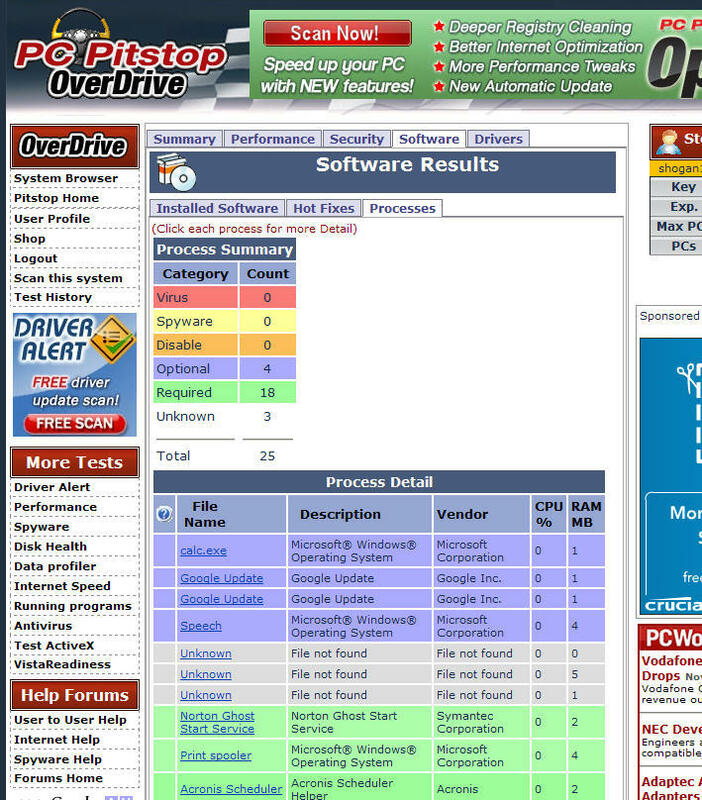 OverDrive is an advanced suite of information that not only gives a rundown of your hardware and its performance, but actually tells you how to make the suggested corrections. If your time and experience is short it will point you to programs that make the changes for you. OverDriveâ€™s running process list tells us what processes are eating up our resources and what processes are putting us in danger. I personally worked on that list along with many others from Pitstop. Each and every process on the malicious and unwanted list was found and identified by one of us. Itâ€™s a great feeling knowing weâ€™re a part of the good guys in this world. Our past affiliations with other good guys like Kim Komando, PC World, BillP, and many others are just one part of how weâ€™ve grown and developed our strategy for your protection. We fought even when lawsuits threatened to stop our progress. We were in good company then and we are in good company now. Each day we are updating and improving OverDrive. Optimize has been updated and a new version released with Optimize II. Exterminate is currently receiving the finishing touches it needs to become Exterminate II, a POWERFUL and HUGE improvement over the original Exterminate. This transformation incorporates the absolute latest Vipre detection technology used also by a leader in this area, Sunbelt Software. The Washington Post quotes Alex Eckelberry, president of Sunbelt Software as describing the problem as “pandemic”. Exterminate’s humble beginning as a spyware detection and removal program bears no resemblance to the savvy sophisticated Exterminate II. Exterminate II wipes out virus, scareware, bots, and Trojans, and with the introduction of new Exterminate II, itâ€™s done from the clouds. Cloud computing, SAAS and eventually Nirvana are all methods PC Pitstop is developing for you. This means you can keep, schedule, and control your protection from a secure location away from the nastys that assault you. Instead of wrestling a system that wonâ€™t let you download, use the internet, or run a removal program, your system can be cleaned and protected automatically. Virus definitions and new threats are automatically added to your protection and your system is scanned and cleaned before you even know there was a problem. This is what PC Pitstop is all about. Beating the bad guys and protecting you. This is what has driven us for nearly a decade. It has formed us into a determined team, intent on fighting the daily battles to crush the scumware and win the war. *Wait! Stop! Hold the presses! After publishing this article I returned to the computer mentioned above to find that it was still infected with the AV2009 virus. I’m doing research for the best and easies fix for this problem and will post it as soon as I’ve had a chance to preform other fixes and confirm their success. I’m sure I’ll have a proven answer soon. **Looks like our pals at BillP have found an easy solution. I’ve given it a try and will report back after testing for 48 hours. Bits from Bill Looks like we are all being blocked by these scumbags so use this link for the download. The Pit Blog hardware problems, information, OverDrive, PC Pitstop, protection, scareware, scum bags, software testing, thumb drive, weâ. permalink. Hey Mike, thanks for the confirmation. I encountered the same problem IMMEDIATELY after using the new-and-improved (NOT) version of MyWay email. Fortunately, a week before the incident, I had installed MalWarebytes ANTImalware, otherwise I would have been unable to do since the malware rendered the keyboard useless. Nothing is perfect, but being netter then Microsoft at security isn’t very difficult. My 85 year old dad seems to find a way to pick this up on a weekly basis, and it makes his older XP machine just about useless. I have been able to rid it each time with Malwarebytes program without a single hitch. Until I found this program, I just about had to reformat his machine. You can’t get most anti-virus programs to work if they are installed, since it finds a way to shut them down. And since you can’t run Hijack this (at least I couldn’t) how can you get any help. If you continually get progressively stronger warnings about some terrible trojan, and the popup doesn’t look like your virus software, you sunk, just cruise on over to Malwarebytes.org, and download their program and after reboot all is gone! to get rid of AV2009 i just opened it up, ran task manager went to processes, found out what the files were called searched and deleted them off my hard drive, after that no more worries about the program. its not the OS makers fault for spy/scare/malware attacks really, the developers of said ware filesm are just exploiting the security holes in the OS, but if you were to make an OS yourself could you honestly say you would make it impervious to attack? a friend of mine had a problem with the AV2009, i helped her remove it with malware bytes but since then she is still having trouble with an unknown sound file that says congratulations you have won.. ipod,, etc.. ive tried to help her find this file,but as shes in cali and i am in mj its getting frustrating.Any suggestions? Thanks for the article everything you say about this annoyance is true. If the bank vault makers make vaults that default to letting anyone in without any effort, then the bank vault maker is the one who is at fault. But more importantly the fault also lies with the people who would by choice use such a system and then have the audacity to actually complain when others simply walk in, take what they want, and walk out. I used SpyNoMore to get AV2009 out of a friend’s computer. I bought it using my own connection so there was no need to risk his CC details. It meant buying their standard three licences so the activation code could be used on his machine but it worked no problem. This is just ironic. PCPitstop has become nothing but a me too Vista bashing site, yet this kind of drive by infection is nearly impossible on a fresh Vista installation due to the much derided UAC. The best advice is for people to follow on XP is to avoid connecting to the Internet until SP3 is installed, along with your anti-virus software and to set up a limited user account before connecting to the Internet. If your hardware supports it and you have no specific reason to stick with XP, it may be cheaper in the long run to move to Vista instead of buying all these different anti-malware solutions. This is primarily why I use Autopatcher when building a system. I can build the os, and patch is fairly current before ever connecting it to the internet. If you want to get stopzilla. Go to trial pay. You get the full version in return for trying another product like superpass or columbia house. That is what I did. Don’t know if its just the yearly version or a lifetime license, but $14.99 –> 69.00. I think its a good deal. My advice is and has always been the following: When setting up a new pc make sure you are NOT connected to the internet. Make sure you install the latest internet security and virus software, Then you can connect to the internet. It’s pretty much common sense these days with all the scum out there in cyber world! The only software I found that takes care of AV2009 first time is STOPzilla. You can purchase a lifetime of protection for $69.00. I wonder – was this WXP RTM that you installed? I’m thinking that a slipstreamed SP2 or SP3 might not have had this happen, becuse the Windows firewall is turned on by default with SP2 and SP3. Also, many more security updates would have been included. Would that have helped? I agree that there is some connection between the OS maker and the perpetrator, but it is NOT the fault of the OS maker. why dont the av company join and make 1 program like avk 2009. use like kaspersky and norton engines but for spyware use spyware doctor and malware bytes then for firewall zone alarm or comodo . I would like to know if Mac owners get any of these problems or is it just us M/soft users ? I can’t begin to calculate how many hours I have spent ridding my PC’s and those of my family and friends of this garbage over the years and now it seems it is on the increase! Michael W. be careful what you wish for. Here in America, we have more than enough laws on the books. They’re not stopping Paulson and his cronies from looting the treasury, which is a much larger crime. Michael W, how about passing legislation legalizing the tourture and killing of those who create such insecure operating systems? I seriously believe that 99% of the people out there blame the wrong parties involved in the mess that is malware. I have work on pc’s since xp came out so am good at fixing them . Lavasoft , hijackthis , Spybot – Search & Destroy , Zonealarm , AVG anti-virus have stopped this scareware for now . But what surprise me the most is that before u even think about getting on the internet with windows: 98,98SecEd,2000,Xp on the cd’s i have here are infected Alexa Toolbar spyware is in windows installer on all my windows cd’s. I meant selling your identity, of course. 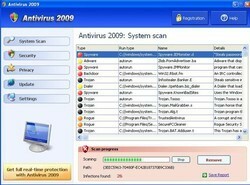 Antivirus 2009 is much worse then just scareware. It works by collecting data from you including the credit card and security code. This data is stored on your PC and then uploaded to the Antivirus 2009 site. They have your identity at this point and can make much more than $40 by collecting and seeling it. Nasty. I’ve had this problem on two separate events. I can fight it off, but it’s been, both times, a three day battle. I can see why most of the time the target will capitulate and pay these bastidges the forty bucks they demand. May they all die of the French Pox! HoneyPot tests say XP unprotected with an internet connection (you don’t even have to use the internet)lasts only a matter of minutes before being infected with something.